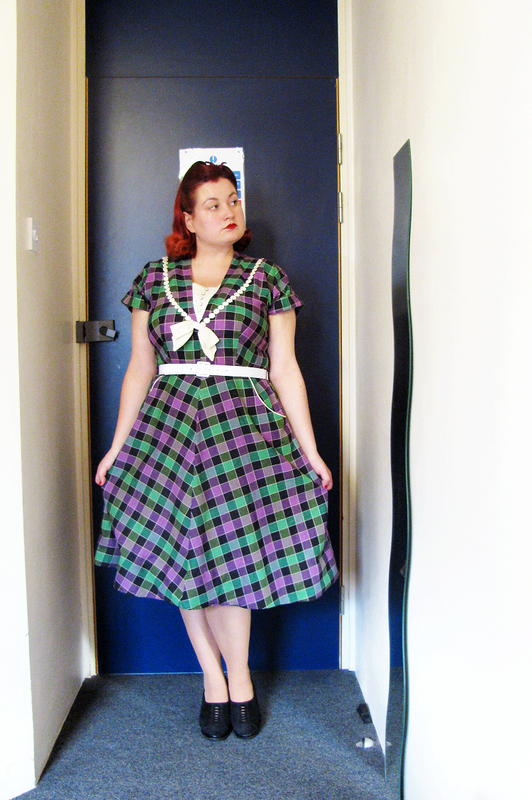 I won this late 1940s/early 1950s vintage day dress with a purple and green check pattern on Ebay a couple of months back. I quite literally gasped when I came across this number (and won it for a decent price!) because it combines so many details that I'm obsessed with, such as bow detailing and wide hip pockets. Oh my! Plus, I love the colour combination. 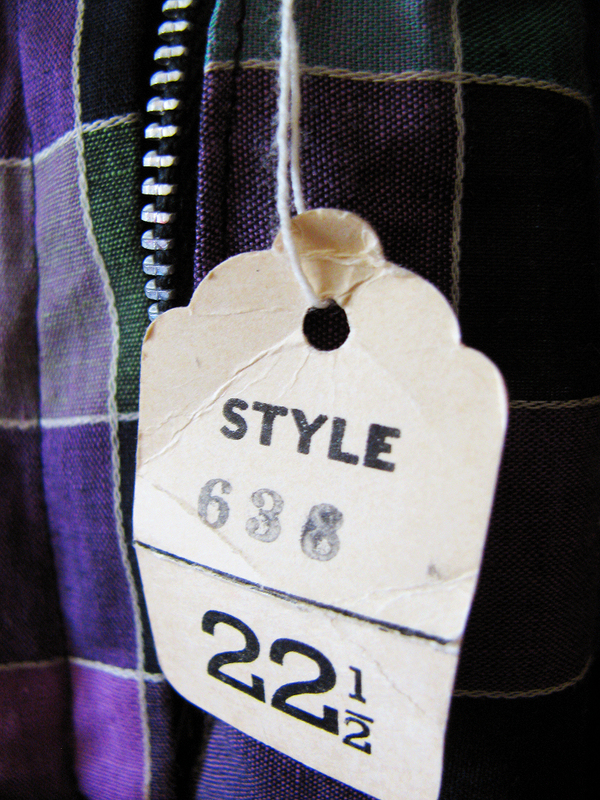 Better yet, the dress was deadstock with the original tags still attached, albeit the original belt was missing. I don't know about you but I always feel a sense of guilt when I remove originals tags from a decades old item that has never been used. But, in the end, these dresses were made for wearing! After my friend Dale shortened the skirt a little bit for me, I was excited to take it out and about on its first outing last weekend! The one of the tags tells me that the cotton dress is by Montgomery Ward. 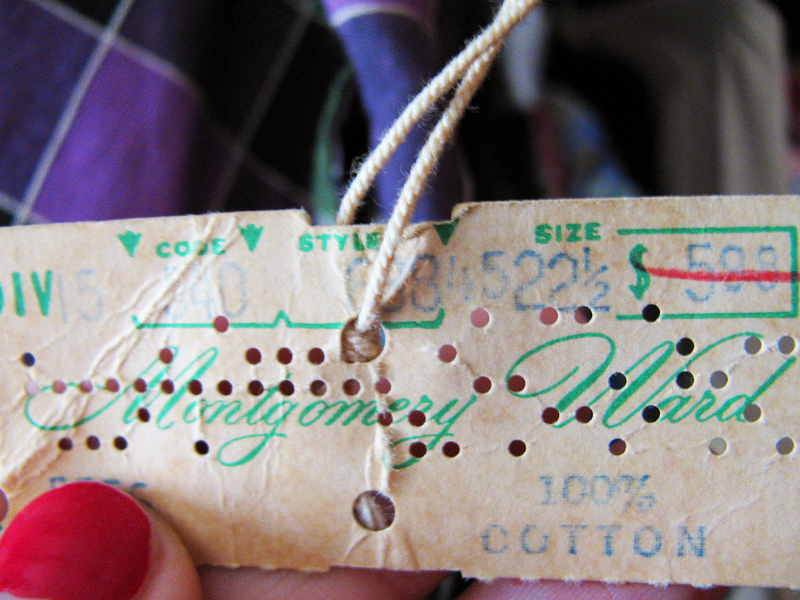 According to Vintage Fashion Guild, Montgomery Ward was the world's first mail order catalog business. It was established in 1872 by Aaron Montgomery Ward. The business was catalog-only until 1926, when the first Montgomery Ward store was opened in Plymouth, Indiana. Within four years there were more than 500 stores across the country. During the 1950s Montgomery Ward began to fall behind its competition, as most major retailers were moving to the suburbs. By the 1970s the company was in serious trouble. They continued to struggle and declared bankruptcy in 1997. But here I am in 2011 wearing my Montgomery Ward dress. I paired it with 1940s suede pumps, a white belt and a purple hair flower. It was a little chilly outside so I wore it with a green sweater outside, as evident in my previous post. Lastly, as some of you have already noticed, I have finally put up a new look here at Harlean's Heyday! My partner Minna Nora painted the header (watercolor and pencil on paper) while my friend Mycah helped me modify the design. It is good to have creative people in your life when you're rather on the helpless side yourself. ;) Russian Red smooches at both for their help! I hope you like the new layout as much as I do! Such a perfect, stunningly cute dress for you! That's an amazing American vintage find! Congratulations! You look fantastic.